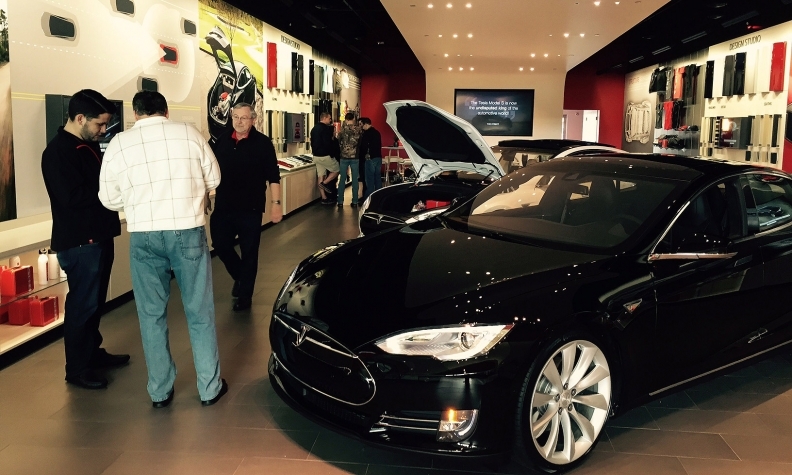 Tesla advances in effort to expand in Ga., fails to gain entry to W.Va. The Georgia Senate on Wednesday gave a final “aye” vote on a bill that would allow Tesla to sell at a maximum of five stores, instead of three. A bill before Georgia’s governor would let Tesla Motors Inc. add to its stores there, while West Virginia has rejected a proposal that would have allowed Tesla to sell directly to consumers in the state. The Georgia Senate on Wednesday gave a final “aye” vote on a bill that would let Tesla to sell at a maximum of five stores, instead of three. The bill, which has been sent to Gov. Nathan Deal for approval, came from an agreement between Tesla and the Georgia Automobile Dealers Association, The Atlanta Business Chronicle reported Wednesday. The Georgia dealers association was unavailable for comment today. Crane believes that direct distribution on a national level will be allowed eventually, but he is unsure when that will be. Tesla officials applauded the measure and called it a great victory for consumers. "The Atlanta metro region has the second-highest percentage of new electric car registrations in the country, and we anticipate that enthusiasm will only grow," said James Chen, vice president of regulatory affairs for Tesla. In August, the Georgia dealers association filed a petition of enforcement with state regulators accusing Tesla’s manufacturer-to-consumer model of violating Georgia law by avoiding dealerships. The dealers association asked state regulators to block Tesla from selling vehicles, rescind its dealer license and deny Tesla from renewing or reapplying for a license. Dealers said that Tesla inappropriately acquired a license by saying that it qualified for a statutory exception that permits direct sales for makers of custom vehicles selling fewer than 150 vehicles per year. Tesla did not qualify for the exception because it does not manufacture to custom design specifications, and it sold 173 vehicles in Georgia from October to June, the association said. Tesla later argued that it did not violate Georgia law because the sales restrictions under its license agreement apply to calendar years. Tesla tried but failed to establish stores in West Virginia, which would have put its outlets on the borders of Ohio, Pennsylvania, Virginia, Maryland and Kentucky. Tesla lobbyists visited West Virginia to amend a bill that was written to clarify responsibilities between automakers and their franchised dealers, said Ruth Lemmon, president of the West Virginia Automobile & Truck Dealers Association. After the state Senate had approved the original bill, Tesla proposed the amendment, which would have opened the door to Tesla stores. While a similar bill was before the West Virginia House, “an amendment was made that was actually much broader than Tesla had proposed,” said Johnnie Brown, general counsel for the West Virginia dealers association. The amendment proposed that any manufacturer could operate in the state as long as it has fewer than five stores. The House struck down the amendment and accepted the Senate version of the bill, which had no Tesla provision. That statute would eliminate the potential for Tesla sales. The company declined to comment on the West Virginia bill. If the governor does not sign the bill, “West Virginia would go back to old franchise law, which still would not allow Tesla to come into our state,” Brown said. West Virginia isn’t rejecting technology or electric vehicles, she added.